Summer 1940 - RAF Biggin Hill is at the heart of the British defence against the Luftwaffe and vital in the prevention of Operation Sea Lion being a success. Seventy-five years later the airfield plays host to the second edition of the 'Festival of Flight', which set itself the mighty task of paying tribute to the great sacrifice of 'The Few'. With early plans for the show including a set-piece involving pyrotechnics at the centre of the commemoration, the show received a great deal of interest and excitement. Therefore, with the Royal Air Force's Typhoon and Spitfire synchro pair, the Airbus owned Messerschmitt Bf109G and the newly restored Bristol Blenheim MkI all on the participation list, it was no surprise that just over a week before the show the organisers announced that the event had reached its 18,000 capacity. 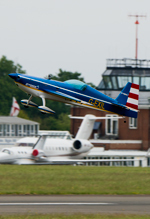 Scott Perry was among the capacity crowd at Biggin Hill and reports for UK Airshow Review. The improvements from last year's show were evident immediately upon arrival at London Biggin Hill Airport; it was pleasing to have a smooth drive straight into the car park and join the entrance queue; a vast improvement on the situation compared to the previous year, where various holding car parks were used which seemed to cause much confusion among the staff when transferring cars to the main car park. A much better first impression of the show. Unfortunately the weather wasn't as kind in its greeting, with a blanket of low grey cloud that showed little sign of changing; that was until a light shower just before the flying display was due to commence - thankfully this was the worst of the weather for the day with the clouds starting to break afterwards. Despite the improving weather over the airfield for the flying display, it was the inclement weather elsewhere that would provide the biggest challenge for the show. This caused the Duxford based Bristol Blenheim MkI, Hispano Buchon and B-17G 'Sally-B' alongside the Breitling Wingwalkers from Rendcomb all to withdraw from the flying display. Another pilot prevented from reaching the show due to the weather was Chris Burkett who had been due to display his Extra 300S with a remote controlled model, painted in a matching scheme - as a result the model was left to perform the display as a solo. The remote controlled models were a fixture of last year's Festival of Flight and they were given a segment before the start of the main display this year too, in addition to filling vacant slots left during the day by the various cancellations, which included an impressive routine by seven assorted Second World War warbirds. The duty of opening the second Festival of Flight was left in the capable hands of Steve Jones, with Paul Bohnomme unable to reach the airfield in time to be able to lead the Red Bull Matadors duo. Steve still managed to inject the usual energy that the Matadors bring to any show, especially when coupled with commentary from the enthusiastic Brendan O'Brien. A great way to begin proceedings and set the pace for the afternoon. 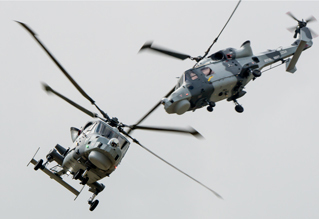 The display team theme continued with the debut display from the Royal Navy Black Cats using two AgustaWestland Wildcat HM2s, the transition of the team now complete to the Wildcat following the Lynx and Wildcat combination seen last year. The pair performed a good routine, which featured many of the manoeuvres that have been present in the displays over previous seasons with the Lynx. The Yakovlevs again continued the aerobatic opening to the show with a Yak 52 and a trio of Yak 50s, managing to fit in a full display with the cloud base rising. Peter Teichman added his usual finesse to the show in his P-40 'Lulu Belle', although he was possibly slightly unfortunate to be the penultimate act on the programme meaning that his display preceded the only other warbird display, aside from those involved in the set pieces, in the Spitfire finale. While the grouping of similar displays can lead to well matched segments of the display, it can also mean that some displays are slightly overshadowed on some occasions, which unfortunately felt like the case in this instance. The first half of the main tribute to the Battle of Britain featured the civilian owned warbirds at the show and was a brilliantly choreographed piece of airshow theatre, not only designed to entertain the audience but also educate on the role RAF Biggin Hill and those based there played within the battle. The set piece began with the Biggin Hill Heritage Hangar's recently repainted Hawker Hurricane MkI which represented the role played by the Royal Air Force in the precedent of the Battle of Britain, the Battle of France. Once the Hurricane had cleared it was the turn of the Airbus owned Bf109G to perform, making its first UK airshow appearance since the Royal International Air Tattoo in 2010, simulating an attack on the airfield with strafing runs while BHHH's trio of Spitfires backtracked the runway underneath. In addition to the attack sequence, it was great to see the Daimler-Benz engined Bf109 being displayed in its own right by Klaus Pasa, something that we weren't fortunate enough to witness on its last visit to the UK. As the Spitfires were scrambled the pyrotechnic teams took over to simulate a bomber attack, before the trio of Spitfires reappeared to defend the airfield. A pleasing tail chase sequence was interrupted however by the returning Bf109G which returned for a dogfight with one of the Spitfires. This itself was a very well-choreographed routine with the need to gain an altitude advantage very well demonstrated by the two pilots. Sometimes when this type of routine is attempted we can see more of a tail chase taking place, which while may be smoother and more visually pleasing, it was great to see a real effort had been made to avoid that within this dogfight sequence. 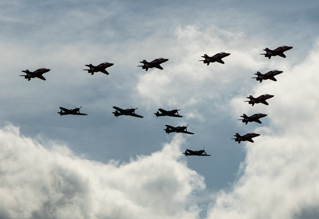 Concluding the first half of the tribute, all of the aircraft involved performed a final formation flypast together, in salute to those involved in the battle seventy-five years ago. While this may not be the largest scale display that we will see through the year in tribute to the Battle of Britain, the brilliant choreography of the sequence maximised the effect of the display. After a small hiatus in the programme for some more model flying, filling the gap left by the unserviceable RAF Chinook, it was the Royal Air Force's turn to take to over, commencing the second half of the Battle of Britain tribute. Having already taken part in the Queen's Birthday Flypast earlier in the day, the Red Arrows were first contribution from the Royal Air Force. The team were limited by both the weather and airspace restrictions, due to the airfield's proximity to London, which resulted in a mainly flat display with a few rolling manoeuvres. Following the Red Arrow's display, the team disappeared for a short while to join up with a pair of Hawker Hurricanes and three Supermarine Spitfires from the Battle of Britain Memorial Flight for a special flypast in tribute to 'The Few', the nine Rolls-Royce Adours and five Merlins together in perfect harmony. Following the recovery of the Red Arrows, the BBMF fighter quintet ran in for a series of flypasts, which included a pair of coveted topside passes. Photographers at airshows are often critical of the BBMF, however the flight must be commended for working such passes into the routine, a rare opportunity to see so many of the flight's fighters together. Completing the RAF's tribute was the Synchro pair of Typhoon and Spitfire, with possibly even tighter formation than their debut at Abingdon, which was particularly noticeable in their first pass offering the crowd a topside view of the pair. This was a particular highlight given that similarity between the scheme applied to the Typhoon for the display this year and that of the MkIIa Spitfire that was used for the on this occasion. Another routine that deserves much praise, offering plenty of opportunity to see the aircraft together before breaking into the opposition part of the routine. The honour of performing the traditional Biggin Hill Spitfire finale fell to Steve Jones and Paul Bonhomme. A rather different mount to the pair's usual Red Bull schemed XtremeAir XA41s, the pair took to the skies in two Spitfires, both supplied by the Biggin Hill Heritage hangar. As the display started, set to Jerusalem, the crowd fell silent, both in awe and in tribute for the final time to 'The Few' who defended the country from RAF Biggin Hill seventy-five years ago. Powerful, low and tight was the main theme of the display, yet still maintaining the grace of the Spitfires. The trust and skill between the pilots evident throughout the routine with their tight formation. The setting, flying and accompanying music together delivering one of the best warbird displays that I have had the pleasure to witness in recent times, on par with the fantastic displays by the Old Flying Machine Company duo and the Eagle Squadron. Certainly worthy of bringing the show to a close, with a victory roll from each aircraft. One notable change from the first Festival of Flight was the switch to a more conventional display period, rather than multiple small segments of flying broken by long breaks, which seemed to work much better. While still allowing for aircraft movements to take place in between the displays. There appeared to be a clear structure to the flying programme with the aim of maximising the effect of the Battle of Britain theme, which was achieved to great effect. This coupled with the unfortunate amount of cancellations within the display, especially items such as the Chinook and the Breitling Wingwalkers which would have offered something different to the display, left the show feeling that it slightly lacked in variety. 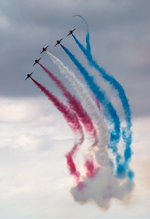 Perhaps the addition of a jet or two, aside from the Red Arrows and RAF Typhoon involved in the synchro pair routine, to the display would have given a more balanced feel to the programme. That said, the organisers focus on the Battle of Britain theme paid off and the perceived lack of variety was therefore understandable, with the focus of the day rightly on the salute to 'The Few'. Last year's inaugural Festival Flight had many teething issues, while this year was not perfect, a vast improvement was evident. As the first impression of the show, the parking and entrance to the showground was a far smoother experience than before. The large queues for toilets and food around the showground did not seem to be an issue again this year with a notable effort to place more of the aforementioned facilities around the showground. The only main issue that many have lobbied was the traffic management on leaving the show, with many reports of people taking just as long if not longer to get out. Perhaps another of the exits that were used for the Air Fairs hosted at the airfield could be utilised in future which would relieve the pressure of traffic on a single exit gate. Although from personal experience the exit was much easier and organised than last year. Another bugbear from the show was the amount of room taken up on the crowd line by people marking their territory with windbreaks, an exclusion zone similar to that at the Royal International Air Tattoo would be most welcome at next year's event to allow as many people as possible to take advantage of the 'premium' vantage spots. Overall, given that the Festival of Flight is still a relatively new event, it was great to see that many lessons had been learnt from last year to enhance the experience for the visitor. 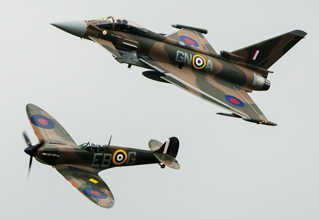 With the Battle of Britain salute at the forefront of the show this year, despite some elements of the show being prevented by the weather, the organisers put together a worthy tribute. We look forward to next year's Festival of Flight which has already been confirmed for Saturday 18th June 2016.